Bill and I are always looking for new places to go, things to see and places to hike. 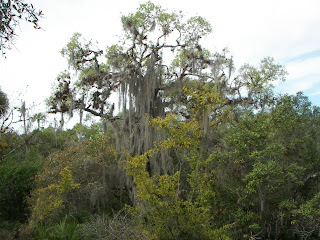 Last week we went to Hickey's Creek Mitigation Park - part of the Florida Birding Trail and Lee County Parks and Recreation- to hike. The terrain was interesting. Since the park was more inland, it was quite different from our usual walks near the shorelines. Part of the trail ran along a river, but most of it was dry plains and there were even some hills and valleys along the way. 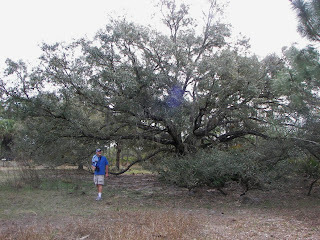 Just look at this big old tree - it dwarfs Bill. We did not see much wildlife but had a great 6 or 7 mile hike along well-marked trails. 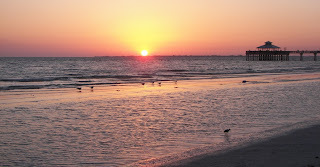 Fort Myers Beach is beautiful at sunset. The pier in the distance is where I go to fish. This picture was taken on the pier. 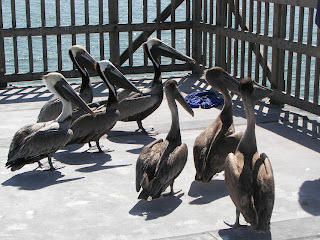 These hungry Brown Pelicans were begging for a handout. The males have the pretty white and yellow markings on their heads while the females are plain brown. Mike and I tried our hand at fishing and this picture is proof of our success. I also caught a huge fish - but it wasn't as big as Mike's fish. Since I had so much fun, I bought myself a new pole, tackle box and fancy bait. 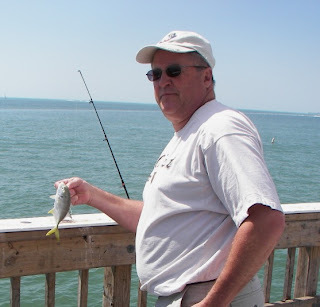 A few days later I headed to the pier and all I caught was seaweed but I looked like a real fisher-person! 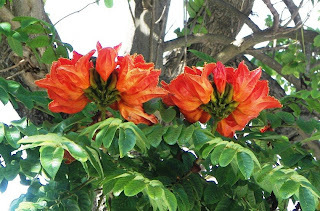 When we were in Naples last week for the Art Festival, I saw this beautiful flowered tree. I don't know what it is yet - but it was as striking as any of the art we saw. 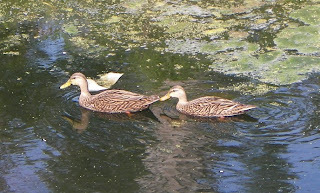 These are Mottled Ducks - found only in Florida and along the Gulf Coast. They were swimming in one of the many canals that run along the sides of the roads and since I was riding my bike, I could stop for a picture. Mike, Mel, Bill and I ate dinner at one of the great little places right on the water. 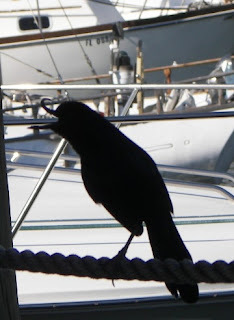 This noisy bird demanded our attention. Look at his bill! I can't imagine how that could have happened. We have enjoyed spending time with our friends. 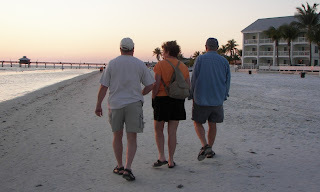 Tomorrow we are all heading East to Homestead Air Force Base for a couple of nights. We plan on visiting Miami and driving down to Key West. 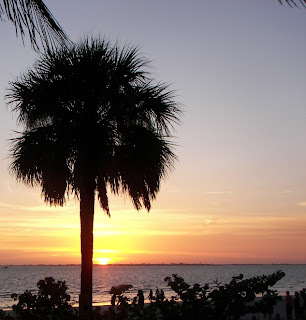 I've never been to the Keys so I am really looking forward to the trip.